I'm drawn to unusual edible wild plants and foraging. But I'm also keenly aware that our few remaining natural areas just can't sustain much wild harvesting. One great way to deal with this conundrum is to grow native plants in our own gardens and harvest them from this sustainable source. So this weekend, for the first time, I harvested and ate some of the wild ginger I've been growing for years. Wild ginger (Asarum canadense) is a woodland perennial groundcover native to the forests of northeastern North America. It spreads quickly, creating a dense, gorgeous mat of heart-shaped leaves, perfect for shade gardens. The root is an excellent substitute for ginger--the flavour isn't as strongly ginger-ish as the Asian ginger from the supermarket, but it is, I'd say, more complex and interesting. It's peppery and almost perfumey. I dug up a couple of roots, cleaned them, and chopped them up into very fine slices (using only the white part of the root--as the root gets greener and turns into stem, it becomes bitter). I then took some boneless chicken breasts, sliced them in half and stuffed the wild ginger in between the slabs. I cooked the chicken in the oven (wrapped in paperbark--something I'll save for another blog posting later) and served it with a simple mayo/lemon accompaniment. Another thing I did was to steam fresh peas with a bit of wild ginger root. I'll be doing a workshop on growing edible native plants where I talk about these and other unusual culinary garden ornamental natives. It's on July 17, 10am to noon, at the Evergreen Brick Works in Toronto (http://ebw.evergreen.ca/cal/event/edible-native-landscapes). Thanks for the tips. I will propagate some wild ginger from a good stand I know about, in my new yard! Also just moved... such a big deal. 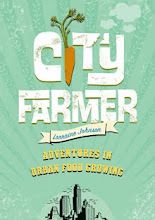 "I heard your interview on CIUT this morning and thought it was fantastic -- especially your emphasis on the need for children to be involved in gardening and food growing, how important it is for them to touch the soil with their bare hands, and how you mentioned that growing food can be easily linked to the Ontario curriculum (i.e. natural sciences, ecology, math, physical education, etc.). The benefits of growing your own food at a young age are immeasurable!" As school food garden educators at Green Thumbs Growing Kids we appreciate and see how valuable hands-on programming and activities in the garden, and interactions with nature are on a day to day basis, so it is great to hear people such as yourself who have a great profile in the community champion its benefits. Not only do we grow herbs, flowers and vegetables in our gardens that reflect the multicultural population in St. James Town, Regent Park, Moss Park and Cabbagetown, but our school programs have now expanded to include cooking in the classroom from the garden produce. We also run community programs in the summer with camps and agencies, as well as host garden drop-ins for the family. Tasting natural flavours from the garden is a most elegant way to encourage children to try new foods and to learn the difference between fresh and packaged foods. The best part is that by actively participating in all phases of the garden cycle, children are empowered by their role of "producer" in the garden, to feel that they have grown what they are eating, and the attendant pride of accomplishment through tangible work. As you articulated the benefits on the radio, we were impressed and wondered if you would be interested in joining our organization and contributing to our strategic direction, which is to advocate for A Garden In Every School. thanks for the wild ginger tips! We heard your interview on CIUT yesterday morning (but maybe it was a re-broadcast) and thought it was fantastic -- especially your emphasis on the need for children to be involved in gardening and food growing, how important it is for them to touch the soil with their bare hands, and how you mentioned that growing food can be easily linked to the Ontario curriculum (i.e. natural sciences, ecology, math, physical education, etc.). The benefits of growing your own food at a young age are immeasurable! Not only do we grow herbs, flowers and vegetables in our gardens that reflect the multicultural population in St.James Town, Regent Park, Moss Park and Cabbagetown, but our school programs have now expanded to include cooking in the classroom from the garden produce. We also run community programs in the summer with camps and agencies, as well host garden drop-ins for the family. Tasting natural flavours from the garden is a most elegant way to encourage children to try new foods and to learn the difference between fresh and packaged foods. The best part is that by actively participating in all phases of the garden cycle, children are empowered by their role of "producer" in the garden, to feel that they have grown what they are eating, and the attendant pride of accomplishment through tangible work. As you articulated the benefits so well on the radio, we were impressed and wondered if you would be interested in joining our organization and contributing to our strategic direction, which is to build capacity to advocate for A Garden In Every School. Thanks again for speaking out for children's gardening in Toronto!